We’d love your help. 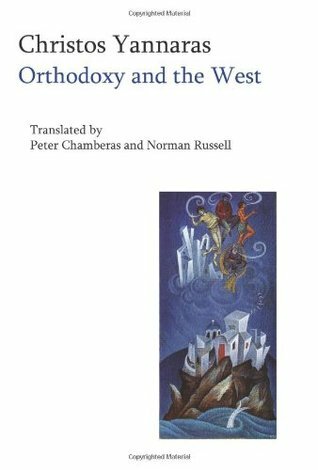 Let us know what’s wrong with this preview of Orthodoxy and the West by Christos Yannaras. To ask other readers questions about Orthodoxy and the West, please sign up. Christos Yannaras or Chrestos Giannaras, (Greek: Χρήστος Γιανναράς), is Professor Emeritus of Philosophy at the Panteion University of Social and Political Sciences in Athens and a philosopher and theologian of the Orthodox Church of Greece. Dr. Yannaras was born on April 10, 1935, in Athens, Greece. He studied Theology at the University of Athens and Philosophy at the Universities of Bonn, Germany Christos Yannaras or Chrestos Giannaras, (Greek: Χρήστος Γιανναράς), is Professor Emeritus of Philosophy at the Panteion University of Social and Political Sciences in Athens and a philosopher and theologian of the Orthodox Church of Greece. Dr. Yannaras was born on April 10, 1935, in Athens, Greece. He studied Theology at the University of Athens and Philosophy at the Universities of Bonn, Germany and Paris in France. He has earned Doctor of Philosophy degrees from the Faculty of Theology of the Aristotle University of Thessaloniki in Greece and from the Faculté des Lettres et Sciences Humaines of the University of Sorbonne in Paris. In addition to other honors, he was elected a member of the Hellenic Author's Society.